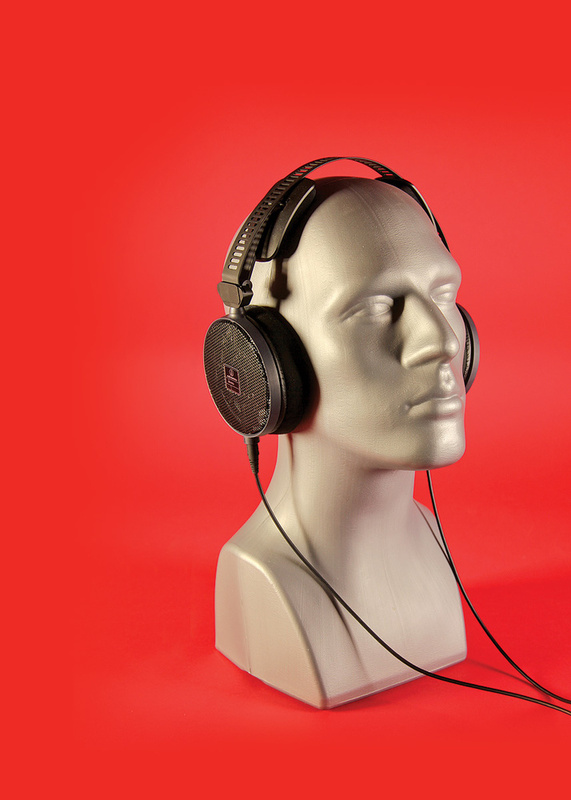 Audio–Technica’s ATH headphones have become a familiar sight in home and professional studios everywhere. From the very affordable yet surprisingly competent ATH M20x to the classy ATH M50x, they are comfortable, easy to drive and share a consistent family ‘sound’ that is obviously to the tastes of musicians. Until now, however, the family has consisted only of closed–back models; and many people who take headphone listening and mixing seriously rightly point out that open–backed designs usually deliver the best fidelity to the source. The manufacturers have now filled that gap with one of two new flagship models. Launched alongside the premium ATH M70x closed–back ’phones (see box), the ATH R70xs are pitched against established rivals such as the AKG K702, Sennheiser HD650, Beyer DT990 and Shure SRH1840. Audio–Technica’s slightly breathless marketing literature lauds their “specially designed drivers and acoustically transparent housings fashioned from honeycomb mesh”, but the greatest enthusiasm is reserved for the detachable cable, which “automatically maintains proper stereo orientation (no matter how it’s attached)”. As seems to be the current fashion, the ATH R70xs are shipped in an impressively oversized cardboard box. Oddly, although the companion closed–back M70xs come with a padded carry case, R70x owners have to make do with a humble leatherette bag. The three–metre, Y–shaped cable attaches at both earcups by a mini–jack that can be twisted to lock it into place, and does indeed preserve stereo orientation regardless of which half is plugged into which earcup. This clever feat is achieved by conveying the full stereo signal on both sides of the cable, but having the left and right earcup sockets wired differently. Neat, but in practice, it’s not that often I want to disconnect my headphone cables, and personally it’s a feature I’d trade for the inclusion of a coiled cable — a 3m straight cable is long enough that you’re constantly treading on it and getting tangled up. The physical design of the ATH–R70xs is quite a departure from that of their closed–back siblings, and indeed from that of most headphones. 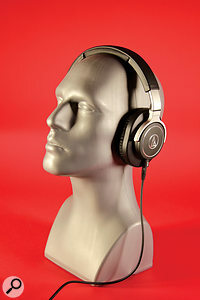 In place of the usual padded headband, the two earcups are connected by a semicircular frame made from slotted metal, which does not touch the wearer’s head at all. The earcups themselves can rotate in the horizontal plane but not vertically; movement in this plane is handled by what can only be described as a pair of flaps attached above the earcups. These are hinged at their bases and lightly sprung, and rest on top of the skull to stabilise and support the headphones. Neither the length of the frame nor the location of the hinges is adjustable, and the first few times I put on the R70xs I felt as though they were about to slide down the side of my head. However, this never actually happened, and once I’d got used to wearing them, they remained comfortable and stable for long periods of use. This is partly because the R70xs are one of the lightest pairs of studio headphones I’ve ever tried: their feather–like 210g mass can be supported fairly easily by the pressure of the earcups alone. With sensitivity and impedance figures quoted as 99dB and 470Ω respectively, the R70xs can be driven from a low–power source such as a USB DAC or laptop headphone output, but anyone who wants to use them at more than moderate volume will need something with a bit more welly. As you’d expect of open–back ‘phones, there is a fair bit of leakage, but they are far from being the worst offenders in this area. Apart from the cheapest M20xs, the closed–back ’phones in Audio–Technica’s M–series share a characteristic tonality which is distinguished by a prominent low bass and a strong treble lift. This somewhat hyped sound has its pluses and minuses: it can make listening more exciting and involving, and makes it easy to focus on mix details that can get overlooked on speakers, yet at the same time can mask problems in the mid-range and exaggerate issues such as sibilance and high–frequency noise. The R70xs also have a character that might be described as ‘scooped’, but it’s obviously different from that of the M–series ‘phones. There’s still a definite high–frequency lift, but on most material it manifests itself much more subtly as a soft, airy, understated presence rather than a brash treble boost. The bass is excellent: deep, clear and even, and slightly forward without ever sounding unbalanced or overpowering. The mid–range, meanwhile, seems pure and uncoloured, albeit slightly recessed and soft. A track that I often use as a reference when mixing is ‘Borstal Boys’ by the Faces; an object lesson in how to cram as much energy and rock & roll attitude as possible into the mid–range, it still sounds great on the R70xs, but it’s a more polite listening experience than you’d get on a neutral or mid–heavy system. Quite a few other high–end open–backed ‘phones have similar just–on–the–scooped–side–of–neutral frequency responses: if not quite a smile curve, then a definite glint–in–the–eye curve. I tend to associate this sort of sound with AKG’s open–back models, for example, and like the K712s and their siblings, the R70xs also present an expansive stereo panorama which occasionally seemed to me to make centre–panned sources appear a little low in the mix. In both cases, though, any deviations from neutrality are small enough that your ears quickly compensate. All in all, these are fine mixing headphones which must be auditioned if you’re in the market for a serious pair of open–backed cans. 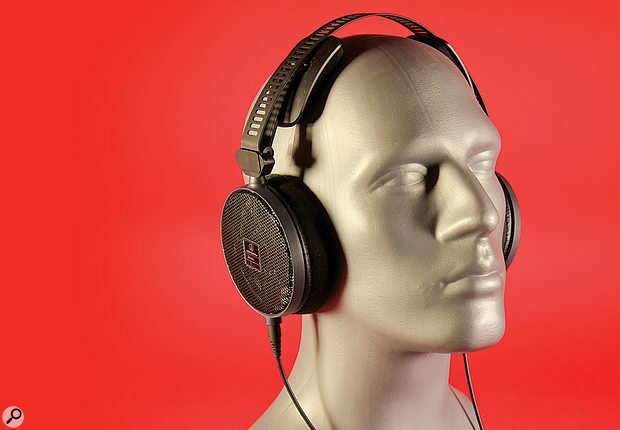 Most of the major headphone manufacturers offer good open–back models in the same price bracket, including AKG with the K712s, Shure with the SRH1840s, Beyer with their DT880s and Sennheiser with the HD650s. 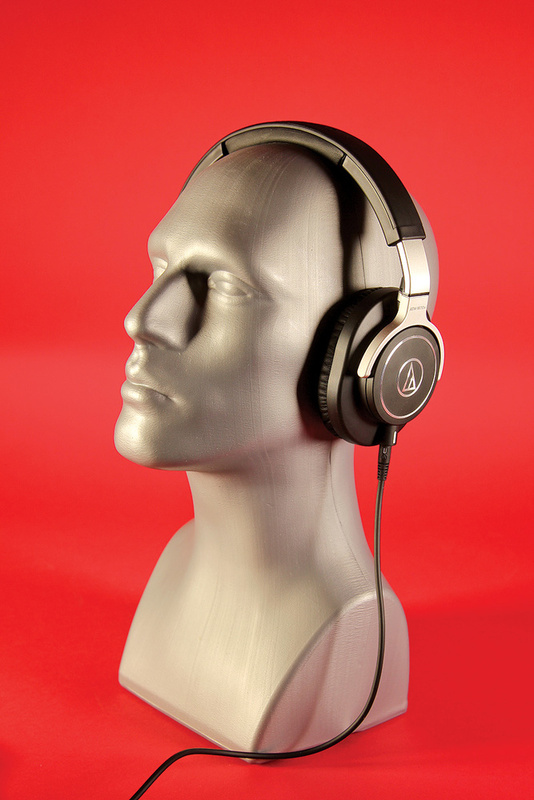 Along with the ATH R70xs, Audio–Technica also sent a pair of their new flagship closed–back ‘phones, the ATH M70xs. These are distinguished visually from the other headphones in the M series by having the forked part of the frame painted silver rather than black. Like the ATH M50xs, their earcups are free to rotate both laterally and vertically, but the headband on the M70xs is much narrower and is padded only in the centre, and although they are by no means uncomfortable, I found the M50xs to have the edge in this department. The flip side of this is that the M70xs appear to offer better isolation. The M70xs are, say Audio–Technica, “tuned for extremely accurate reproduction”, which begs the question as to why they sound really quite different from the R70xs! In practice, comparing the two demonstrates exactly why most people advocate open–back designs for mixing. It’s quickly apparent that the R70xs offer the much more natural and neutral perspective on a mix; by comparison, not only do the M70xs have the inevitable boxy quality that attends all closed–back designs, but they exemplify the ‘scooped’ Audio–Technica family sound. I was able to compare them directly to a pair of M50xs; the top end on the M70xs is slightly different in character but similarly bright, and arguably more prone to harshness (though this might of course change as they get burned in). I think that they should probably be considered alternatives to the M50xs with slightly different strengths, rather than as being their superiors in every respect. Accurate enough for mixing, yet with enough subtle flattery to make a difference to listening pleasure! Can’t be driven loud from a low–powered headphone amp. Slightly recessed mid–range might not suit everyone. Smooth and sophisticated, the ATH R70xs demonstrate exactly why open–backed headphones have the edge over closed–back ‘phones for mixing. ATH R70x £349, ATH M70x £299. Prices include VAT. ATH R70x $349, ATH M70x $299.